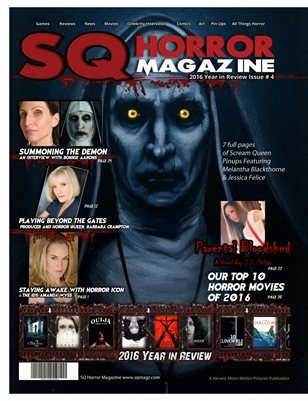 In this edition of SQ Horror Magazine we go one on one with Horror icons Barbara Crampton,A nightmare on Elm Streets Amanda Wyss, The Demon Valak, Bonnie Aarons from the Conjuring 2 , Full pinups of Scream Queens Melantha Blackthorne and Jessica Felice. Our top ten Horror movie picks for 2016. Thankfulness to my father who shared with me regarding this website, this website is really awesome. discussing on the net. You certainly know how to bring a problem to light and make it important.